Our resident artist and sculptor, Chas Fagan, has once again brought pride to our foundry, as well as our country, with his recent addition to Old Parkland in Dallas, Texas. Here, the history of our Nation is preserved and brought back to life for new generations to enjoy and understand. “The American Experiment is intended to stimulate reflection on our nation’s heritage and serve as a reminder of its importance. The thoughtful placement of each piece is meant to entice and intrigue visitors. Visitors may stumble across an unfamiliar quote or an obscure piece of sculpture that invites them to reflect on the intent and look for deeper meaning.” , www.oldparkland.com. The construction of this piece was a massive undertaking. The flag alone called for our welders to exercise their best skills and technique in order to provide strength of structure and execute the exact vision of the artist. The completion of this statue is a fine demonstration of collaboration between the sculptors’ mind and his perfected attention to detail and the talented craftsmen at Carolina Bronze Sculpture, Inc., that dedicate their time not only to excellent quality, but to the artists themselves. Recently, we received a clay piece from the artist/sculptor, William Lamb. William contacted us from Florida and asked if we could help turn his vision of fish in water into bronze. Just as William’s interpretation of the natural world is important to him; we feel the same way about our dedication to our customer’s concerns. Our wax room, metal shop, and general managers all worked closely together to communicate William’s desires into the bronze without jeopardizing the stability of its structure. In the end, we were able to produce a piece that achieved the desired “floating in water” effect that the sculptor had intended. Last week, the finished sculpture was packaged up and sent back to William in Florida. First of Many in Downtown Seagrove! 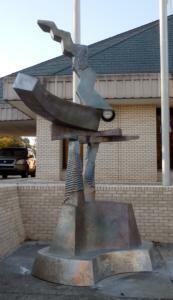 Seagrove, NC has it’s first sculpture located at the corner of Hwy 705 and Main St on the property of Seagrove Stoneware. “Balancing Time II” by sculptor Ed Walker is the first of several temporary sculpture installations planned for the downtown area. “We are doing this as a way to develop arts and tourism in Seagrove,” Ed Walker said. “We have such a great community of artists up and down this road and we need to support all of them. This is an extension of a sculpture park being constructed at the foundry on Maple Springs Road in Seagrove. “There is still a lot of work to do to landscape the area, put in a walking path and set out large scale outdoor sculptures,” Walker said. “We are planning for 15-20 sculptures along a walking path around a 1 ½-acre pond and we have 45 acres to expand later. 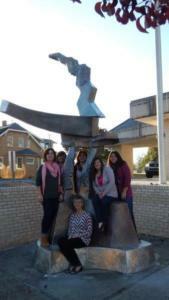 We put a call out to other sculptors and already have 11 commitments. As part of the 6th Annual Asheboro Downtown Sculpture Exhibition and in conjunction with the 38th Annual Tri-State Sculptors Conference to be held in Oct. of 2016, numerous large outdoor sculptures are on display in Asheboro, NC. One of those is “Skate, A Rift in Time”,a 14′ fiberglass sculpture by Carolina Bronze owner, Ed Walker. 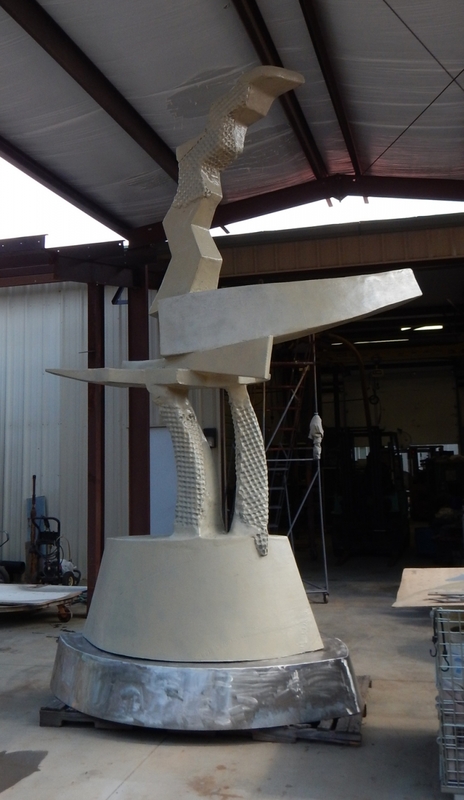 The sculpture will be on display through December of 2016. This is the first of several large abstract sculptures that Ed is planning on completing in the coming year.